(NaturalNews) It's no conspiracy that antibiotics are used during the vaccine manufacturing phase to stave off bacterial contamination of tissue culture cells where the dangerous, infectious disease viruses are nurtured in chicken egg embryo and aborted human albumin (fetal tissue and blood). These so-called "trace amounts" of antibiotics, such as neomycin, are commonly found in vaccines such as MMR (measles, mumps, rubella) at about 25 micrograms per dose, and persons who are allergic to such antibiotics experience severe and life-threatening reactions immediately following injection. Human resistance to antibiotics continues to worsen at alarming rates, quickly becoming more of a threat to mankind than cancer, thanks to their overuse in vaccines, prescription medications and confined animal feeding operations across America. As antibiotic resistance becomes its own worldwide epidemic, estimates show that as many as 10 million people could die every year from bacterial infections by 2050. According to published statistics, that's more people than currently die from cancer. 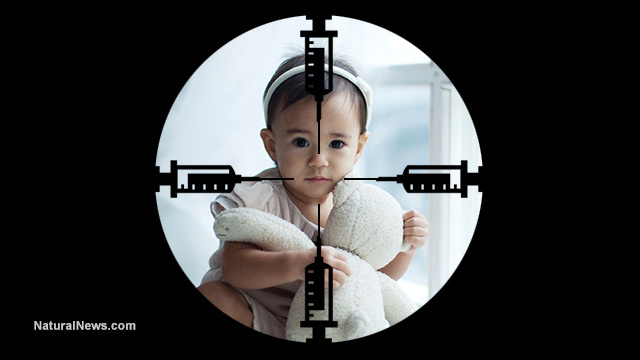 Immunizations are prepared with highly experimental types of antigens using rogue scientific applications of "inactivation" and recombination DNA technology (genetic modification and combinations of viral pathogens). These vaccine preparations also include stabilizer compounds used to prevent bacterial and fungal growth and to reduce contamination, including highly toxic mercury and aluminum gels and salts. Shocking to most humans who find out the hard way, formaldehyde (embalming fluid) is used to "inactivate" bacterial toxins that remain dormant in muscle tissue, but come "back to life" inside the human body. A long time ago, antibiotics helped beat tuberculosis and strep throat, but their overuse has led to the evolution of multiple strains of resistant bacteria, including deadly staph (staphylococcus) and modern-day E.coli infections. For example, patients with staph infections of the skin cannot be treated with penicillin, as the superbug MRSA (methicillin-resistant staphylococcus aureus) is entirely resistant to it. Researchers are finding out that hand sanitizers and "wet wipes" add to the chaos of increased antibiotic failure. Rather than cleaning surfaces, wet wipes and hand sanitizers spread deadly bacteria from one surface to the next. Hospitals are spreading superbugs at an alarming rate also. Injecting the elderly with experimental pneumonia vaccines and infants with jab after jab after jab simply loads humans up with more and more "trace" amounts of antibiotics, fueling the chaos of antibiotic immunity and increasing the lethality of superbugs. From the second we are born, our bodies begin to populate our gut flora as our immune system builds an inventory of good and bad cells. Over 80 percent of this work is done in the intestinal tract, yet no MD on planet earth will discuss this with their patients, knowing that vaccines and chemical-based pharmaceuticals absolutely annihilate good gut bacteria, destroying immunity in the process. How ironic that vaccines and antibiotics destroy immunity when they are purported by every science journal in America to do just the opposite! In fact, one round of antibiotics permanently changes the immune system, indiscriminately killing all bacteria, good and bad, altering the body's ability to manufacture appropriate immune cells. Do the math: Pediatricians regularly prescribe antibiotics to infants with immature immune systems, so their little bodies have no natural defense against chronic and degenerative diseases like autism and Asperger's syndrome – and that's guaranteed repeat business for the doctors. Bottom line: When the antibiotics hit your immune system, the friendly bacteria in the digestive tract that fights off the bad bacteria can no longer aid in digestion and nutrient absorption, leading to irritable bowels, severe nutrient deficiency, hormone imbalances and susceptibility to superbugs. Antibiotics, therefore, enable fungus to grow, and the parasites eat up food and minerals that were meant to feed the body. This, my friends, is exactly where chronic disease begins. This also causes your body to retain toxic heavy metals as they move into organs and tissues, compromising, inflaming and weakening them for future fungus invasion. Now, thanks to vaccines and prescription antibiotics, chronically inflamed organs are the targets of viruses and bacteria. Depleting immunity with vaccines – who knew? Are you stuck in a cycle of sinus, ear or bronchial infections? Stop wondering why. Does your MD know your children's health problems without even looking at their charts? Since we've all been loaded up with vaccines and antibiotics by these rogue MDs, how do we begin repairing the damage? It actually takes years of targeted nutrition and probiotic therapy to replenish the body and all of its systems. Begin by immediately eliminating GMOs from your intake, and shop for strictly organic food, clean water and certified organic probiotic supplements. Ask a nutritionist for advice here. Avoid vaccines and flu shots like the plague (pardon the pun). Remember, antibiotics are the new atomic bomb, so don't get bombarded!